After completing your registration via Wild Apricot, please confirm your registration via this link as well: https://leadfreebaltimore.splashthat.com/. 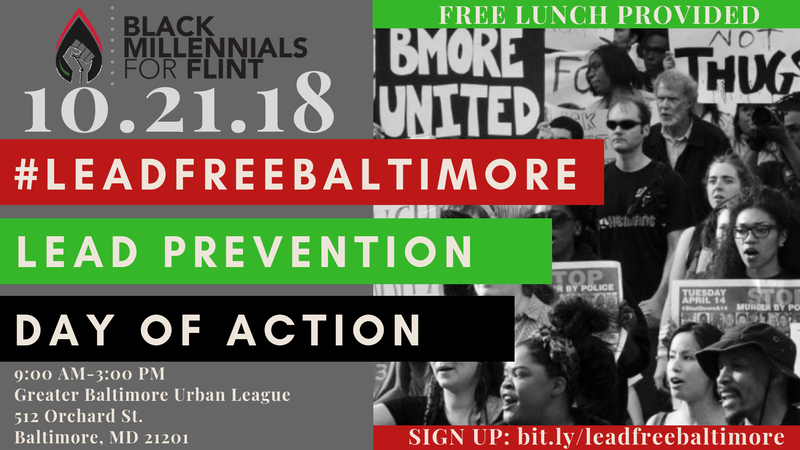 Black Millennials for Flint, the first and ONLY African American and Latino civil rights and environmental justice organization advocating for the eradication of lead in partnership with The Greater Baltimore Leadership Association, Thursday Network Greater Washington Urban League Young Professionals, Northern Virginia Urban League Young Professionals Network and the Children's Environmental Health Network are hosting a Day of Action Kickoff for International Lead Prevention Week 2018 in the heart of Charm City--Baltimore, Maryland. From Freddie Gray to Korryn Gaines, lead in housing has both disproportionately and most violently impacted black and brown communities for far too long. The event will be featured on the new BET Docuseries entitled "Finding Justice". All volunteers and attendees will be provided a media release agreement. On this day of action, volunteers, community leaders, activists and organizers will come together to make a call to action to eliminate lead in housing in the great City of Baltimore. The day will include canvassing, educating Baltimore residents about their rights to #LeadFreeHousing followed by a seminar featuring some of Baltimore's most powerful leaders fighting the the good fight for a #LeadFreeBaltimore.